Following on from a previous post about covers and gender, I had another look at some of mine. I suppose the main ‘target audience’ for Hope’s Daughter is female, young adult, and so the cover was geared towards my taste and ideas, and more than likely a more ‘feminine’ style. (Any blokes who can offer insight as to whether it is girly or not, in their opinion, would be appreciated). I don’t think it’s overly ‘girly’ – but the focus on the Earth and female eye are quite pretty, and the plain white background (in my head reminiscent of the white world she lives in) possibly leans away from darker, masculine elements you tend to find in covers elsewhere. One thing I did want to do in designing the cover was down-play the sci-fi setting, as it is not a sci-fi book in the traditional genre sense, just set in space. 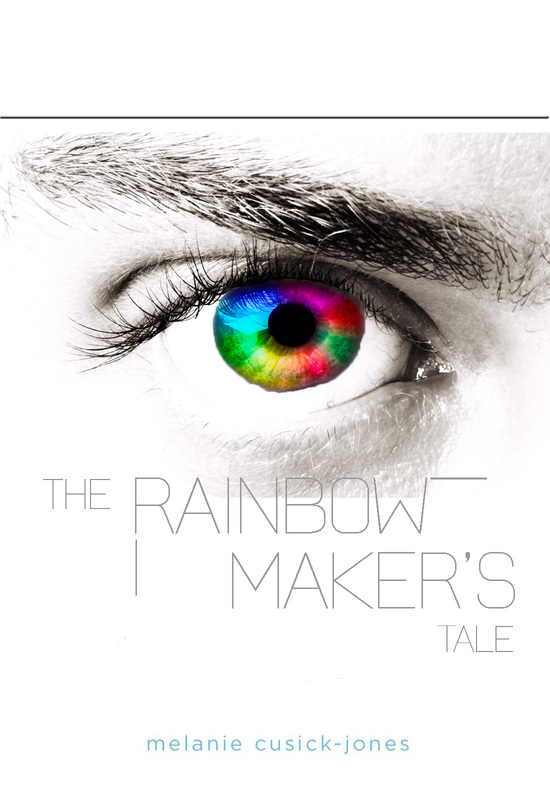 The Rainbow Maker’s Tale, although told from a male perspective, is primarily aimed at the same audience. The cover is a direct reflection of the first – to reinforce that it is a different side to the same story/timeframe – is this girly? Or are both books on the borderline, gender-neutral? I’m feeling all confused, tbh. As a bit of an experiment, I played around with the covers – not major changes as I didn’t want it to take too much time. But, I started with the idea that Balik’s story comes first, and how it might be different…any thoughts? This entry was posted in General, Writing - Ambrosia Sequence and tagged alternative covers, book covers, experiment, gender, hope's daughter, rainbow maker's tale on August 20, 2013 by mel. I stare past the bright banners hanging from the buildings that surround the square and keep my eyes focused ahead, not looking at the faces of those who will soon be standing beside me. I hate the desperate grimness that the reaping day brings to the Seam. Following the line of people, I file in silently like everyone else and sign my name. Then I follow the others as we’re herded into the roped areas, which separate each age group from another and the boys from the girls. The space in the square fills quickly and the bodies press in more tightly around me as even more people arrive. On either side I’m aware of others looking about, exchanging terse nods with their neighbours before focusing their attention on the temporary stage set up before the Justice Building. I’ve kept my eyes fixed straight ahead the whole time and right now I find myself staring – somewhat blankly and without really seeing – at the three chairs nestled beside the podium on the stage. I don’t look at the reaping balls. I don’t want to think about them. I’m sixteen this year. Closer to the front than I’ve ever been before, with my name on more slips of paper inside the boys’ glass reaping ball than I’ve had before. But I know I’m more fortunate than others – I don’t have extra entries for tessera in there – father wouldn’t allow us. We were lucky to be less desperate than many of our neighbours. Two of the chairs are filled, by the Mayor and Effie Trinket. They make an odd pair: one balding and plain, the other bizarrely coloured like an exotic bird. I’m sure that she’s supposed to look beautiful and bright among the drab inhabitants of District 12, but to me there’s nothing lovely about her, only false colours and a garish grin. Even from this distance you can tell they are nervous about whether the intended occupant of the third chair will arrive. The clock behind me chimes – two deep, melancholy bellows – then the Mayor takes his place at the podium and begins his familiar reaping day speech on the history of Panem. I tune out for a while, not really wanting to hear the one-sided review of history again. Nor do I want to hear about the bountiful generosity of the Capitol, who remind us district dwellers how lucky we are to be patronised by them, by killing children every year for sport. I don’t need to remember how much each of us is at their mercy; I see it everyday in the faces of the children at school and in the streets. The Capitol kill us each day of the year, just in slower, crueller ways; it’s just that they don’t bother filming these deaths. Just in time to hear his name announced – the only surviving victor of the two District 12 has managed to produce in seventy-four years – Haymitch Abernathy struggles onto the stage and falls down, drunk, into the third chair. A smattering of token applause rises from the crowd around the square. I’m not sure if it’s for his appearance or the hug he tries to force on Trinket, which she manages to manoeuvre out of. The Mayor tries to pull the attention of the cameras back to the reaping, seeing that – as usual – we are becoming the laughing stock of Panem. I wonder at how Haymitch ever managed to triumph at the Hunger Games as a boy…but then I also wonder about what he saw there that made him this way. I’ve no time to dwell on this as the colourful Effie Trinket springs to the podium and announces with cheer, “Happy Hunger Games! And may the odds be ever in your favour!” If the odds were in our favour we wouldn’t be stood in the square right now, awaiting selection for death – it’s a notion that obviously wasted on Ms Trinket as she happily moves us through the ceremony to get to the important part. It all happens very quickly. Trinket finishes her speech and is moving towards the glass ball with the girls’ names in, announcing “Ladies first!” as she always does. Suddenly there’s something in my chest, a hard, rock-like something that erupts before she finishes unfolding the paper. I don’t know how or why, but I know something awful – even more terrible than usual – is about to happen. The painful bursting in my chest freezes when I realise what has been said, but the terrible feeling does not disappear. I’m aware of unhappy murmurs from the crowd but still my eyes do not move from Katniss’s face. I watch as her body tilts forwards minutely as though something has punched into her stomach; the colour draining from her face in an instant. Then Primrose is there between us – passing down the narrow line which separates the boys from the girls – her small steps are stilted and awkward. For some reason, the thing I notice most is her blouse un-tucking from her skirt as she walks. She looks younger than her twelve years. Primrose is beside me when I hear the noise. Pain and terror and fear rolled into a single word from a single voice. “Prim!” My eyes move beyond the small girl – almost invisible in the crowd of bodies – towards the owner of the voice. “Prim!” Katniss shouts again, her voice strangled and tight. She’s moving now. Not shoving her way through; the crowd peels aside for her and she moves rapidly towards the stage. Around the edges of the square I sense another movement: Capitol guards moving nervously from one foot to another as they watch the scene unfold and wonder if there will be trouble. My own muscles twitch, my legs begging me to move forward and put myself between Katniss and the danger I can see she’s running into. My fingers tense into fists at my sides, the nails digging in to the skin beneath. I was right. Katniss Everdeen will be going to the Hunger Games. I feel sick and angry and powerless all in the same instant. Primrose is clinging to Katniss now. I can see her screaming, but can’t hear the words. Nor do I hear what Katniss says to her or Gale, when he steps forward and pulls Primrose off her back. The small girl’s limbs thrash furiously but uselessly as she is carried back into the crowd. There’s more talk on the stage now. I don’t hear any of it over the rushing in my ears as my heart pummels blood through my veins. Because I know now – just as I did about Katniss Everdeen – that I too will be going to the Hunger Games. I cannot begin to think about how I will explain to my family why I volunteered, although I think perhaps my father would understand a little. I swallow thickly, holding any doubts or questions deep inside me. I am going to be a tribute. As my eyes refocus on the stage I’m in time to see Effie Trinket calling out, “Come on, everybody! Let’s give a big round of applause to our newest tribute!” No one claps. The silence is as total as that during the reaping announcement itself: no one moves, no one breathes. There is only quiet whilst Katniss stares impassively out at the crowd. It’s like this for a few endless moments, then I become aware of a shuffling around me; the lightest whisper of movement. And now I see them: first one person, then another and another until almost every member of the crowd is moving: they touch the three middle fingers of their left hand to their lips and then hold it out towards the blue figure on the stage. My impatient hand moves now, pressing against my own cool lips then offering her my admiration. For the others around me this is thanks, this will be goodbye. But I am not saying goodbye to her. The silence is completely broken as Haymitch careens forward and slings his arm around Katniss’s shoulders, announcing something barely coherent but that sounds like praise. A moment later he pitches head first off the stage and is whisked away on a stretcher a few minutes later. I don’t really listen as Effie Trinket tries to regain control of the stage and her wig to proceed with the reaping ceremony. It doesn’t matter whose name she pulls from the ball, because I know that I will be taking that place. I’m so focused on preparing myself to volunteer that I almost miss the announcement. “Peeta Mellark,” Effie Trinket’s warbling voice proclaims. I’m still for a second or two, whilst I realise what has just happened. And then I’m moving forward through the crowd towards the stage. The odds were in my favour it would seem: I don’t have to worry about explaining why I volunteered now. There is a second piece – Prim’s Diary – featured on Aside from Writing if you’re interested: click here! This entry was posted in Writing - General and tagged creative writing, experiment, fan fic, film release, peeta, peeta POV, peeta's reaping day, The Hunger Games on June 5, 2012 by mel.